MOSCOW, March 4. /TASS/. 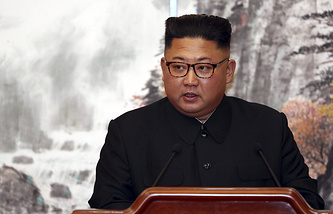 Kremlin Spokesman Dmitry Peskov expects that the exact date of North Korean leader Kim Jong-un’s visit to Russia will be agreed on in the near future. "There is no clarity now. The contacts have been ongoing through diplomatic channels. Indeed, this visit is on the agenda and there was an invitation. We hope that in the near future the exact date and venue will be agreed on through diplomatic channels," Peskov told reporters. Russian President Vladimir Putin said earlier that Kim Jong-un had been invited to visit Russia. Various options for a summit were under discussion until the end of 2018, including on the sidelines of the Eastern Economic Forum in Russia’s Far Eastern city of Vladivostok in early September 2018. Russian authorities have stated on many occasions they are ready to welcome the North Korean leader any time convenient for him. Russian Federation Council (the upper house of parliament) Speaker Valentina Matviyenko said following her visit to Pyongyang in late 2018 that the North Korean leader had expressed readiness to visit Russia.